Once a project has been identified and agreed, volunteers with necessary skills will be recruited. They draw up a plan, apply for funding and manage the project. Typically, a Community Partnership may work on two or three projects at a time, calling on different bands of volunteers. We are always looking for new project ideas to help the community. Recently we have promoted the installation of outdoor adult exercise equipment in Horsham Park and got a mobility scooter training programme set up (working in conjunction with Horsham District Older Peoples Forum). 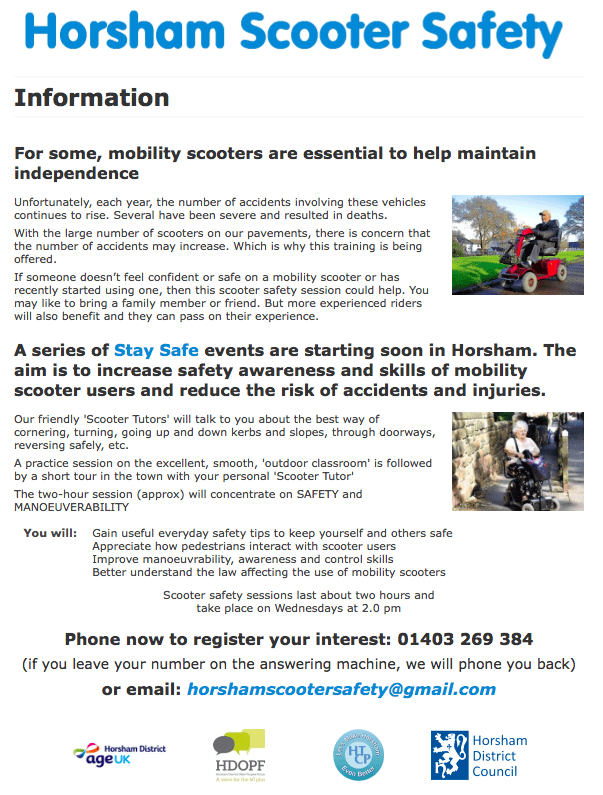 For more information on the Horsham Mobility Scooter Safety Training click HERE. Please let us know if there is anything you can think of that could be of benefit to Horsham Town. Volunteers can contribute to the maintenance, character, heritage and amenities of the town. Interested volunteers are always needed. Working together on a goal or project can achieve something worthwhile for the town and community. Do something different and useful, meet new people, learn new skills and gain valuable experience. It can also be fun! You will gain the satisfaction of time and effort well spent. If you would like to volunteer for any of our projects please contact us. 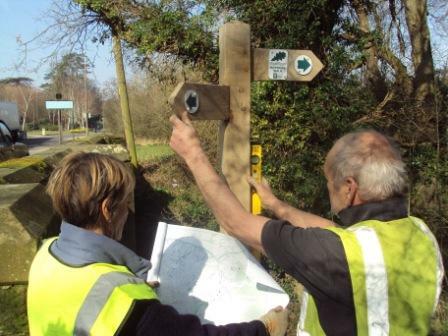 We aim to improve the Horsham Riverside Walk and to give it wider appeal by establishing a further volunteer group to contribute to its maintenance. Maintaining a section of the Riverside walk local to you requires a commitment of a two or three hours a few times a year. Tasks can include cutting back overgrowth, clearing watercourses, removing litter and reporting anything that requires further attention. It’s a great way to help make a difference in your local area and continue to build the strong local community spirit which we are fortunate to have. Other opportunities are also available and if you have a particular skill or interest which you think may help, please contact us to arrange a discussion. 1. 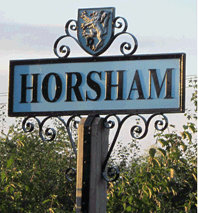 To make Horsham a better place to live – housing, public facilities, natural environment, cycling, transport, climate change, dementia friendly Horsham. 4. Staying and feeling safe – fear of crime, crime & disorder, road safety, crime prevention. Horsham Town Community Partnership will assist local people, groups, organisations and Local Authorities on local projects that fall within the areas above. This may be way of simple advice on grant applications, signposting the way forward, discussing options, offering ongoing support, project management, grant application and or handling grant monies where a group does not have that facility, through to taking on the project. 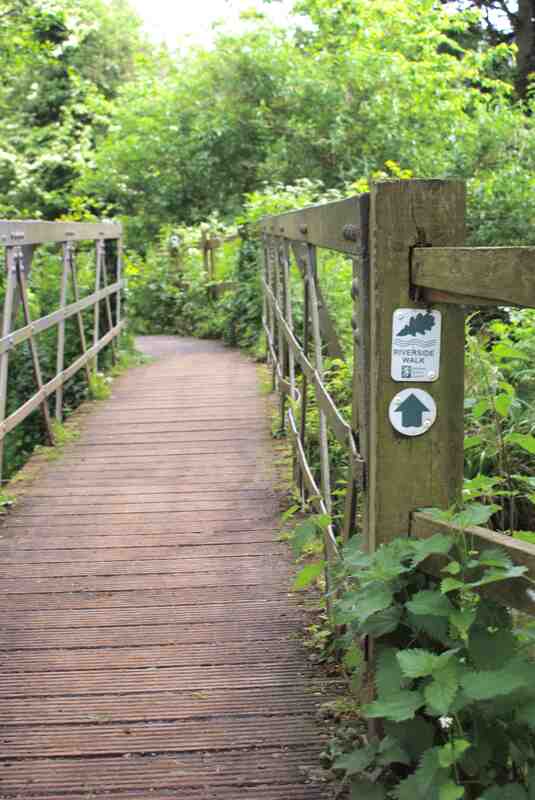 An example of a project taken on by the HTCP is the ongoing highly praised Riverside Walk project, creating a 13mile circular accessible walk around Horsham town. 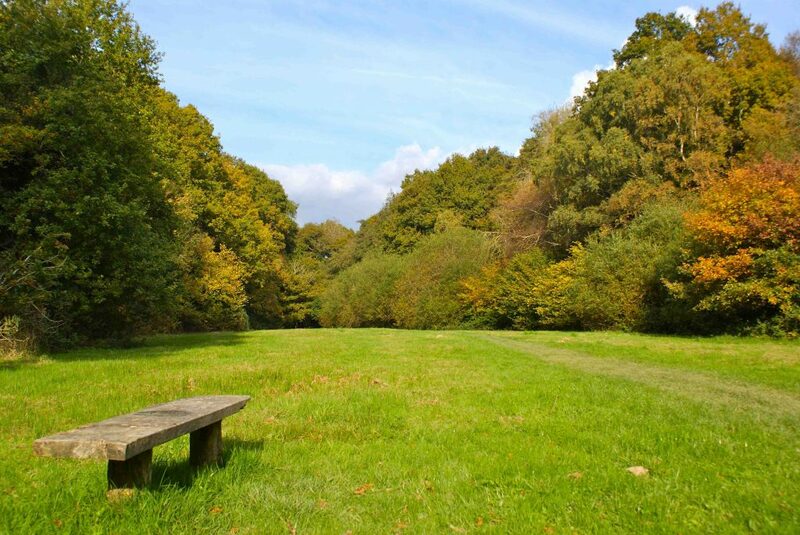 The circular Horsham Riverside Walk on the outskirts of the town is said to be a hidden gem. The walk, nearly 13 miles long, is described and shown on our leaflet and map. 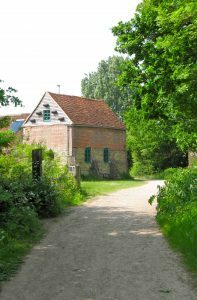 The Riverside Walk follows the water courses surrounding Horsham and up until now had not been as well known as it could be. Stage 1 of the project, completed in 2014, was funded by a major grant from Biffa Award with Horsham District providing 10% match funding. This part of the project addressed:- much better, more cohesive way marker signage; the design, production and installation of six interpretation boards showing the route and interesting historical and nature elements to be seen on the Walk; the purchase and installation of benches both of a rustic design for the rural parts of the Walk and ergonomic benches for less mobile users with a paved surround. Stage 2 of the project is now underway. A new more informative leaflet has been designed and produced. This has been funded by a Community Initiative Funding grant from WSCC County Local Committee. Part of Stage 2 of the project is to address certain areas of the Walk that would benefit from a better path surface while still at the same time retaining the rural aspect of the Walk, encourage the use of the Walk by the provision of appropriate facilities and events, highlight the heritage of the Walk and improve the biodiversity and ecology along the Riverside Walk. 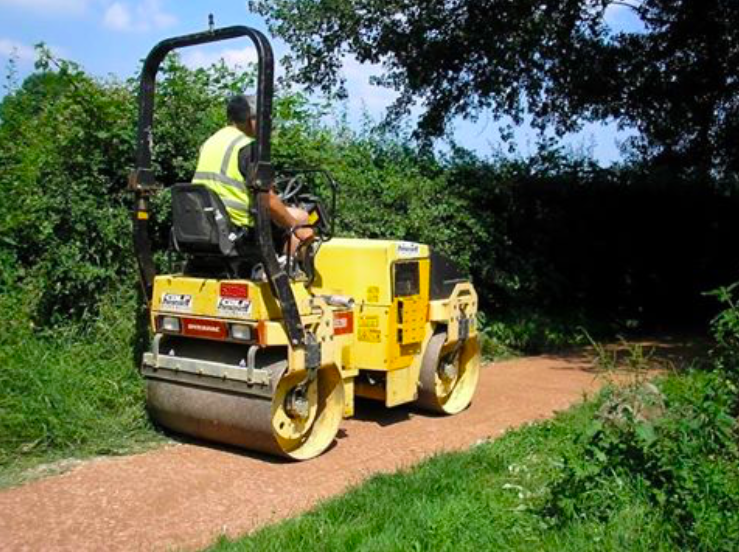 A better path surface has now been installed between Warnham Road and the Millennium Bridge near Merryfield Drive. Work has also been completed on the path near Hills Farm Lane and recently on the path from Sandeman Way to the Brighton Road..
HTCP sourced funding to help Horsham District Neighbourhood Watch and Sussex Neighbourhood Watch revitalise schemes that had been lost or dormant and identify potential new ones. Hyper: Horsham Town Young Persons Council. The group exists to give young people a voice to their concerns and aspirations. HTCP took over the running and management of this important group from Horsham District Council in 2011 and found suitable volunteers to help run the group. Now that Youth Provision in Horsham has successfully been taken over by the contract with Horsham Matters, the running of the HYPER group is now being run within this contract.